Geo.tv – The General Body of Pakistan Cricket Board (PCB) has unanimously given chairman Najam Sethi unqualified vote of confidence during the Annual General Meeting held in Lahore on Tuesday. 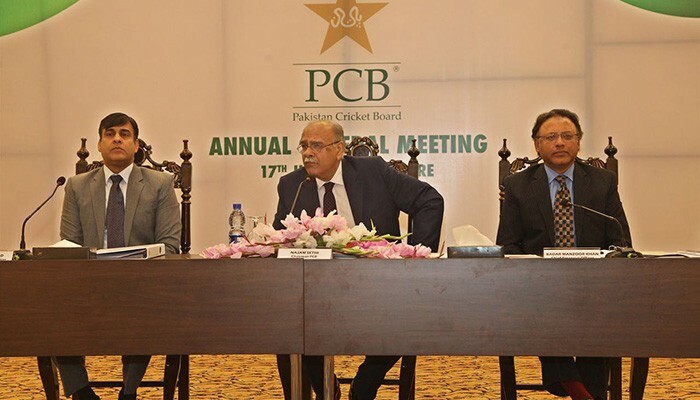 The General Body of Pakistan Cricket Board (PCB) has unanimously given chairman Najam Sethi unqualified vote of confidence during the Annual General Meeting held in Lahore on Tuesday. According to the PCB, vote of confidence resolution by the regional presidents was presented at the Annual General Meeting (AGM) and wholeheartedly endorsed by the entire General Body. Our vote of confidence in him is unqualified; we support his vision for a new and exciting era of cricket that will bring glory to our cricket,” reads the statement made by the elected presidents of regional cricket associations. Besides this, according to the PCB, annual expenditure on Regional and District cricket has been increased by Rs100 million. “The series of matches include three World XI games, T20 against Sri Lanka, three T20s against the West Indies and three PSL matches including the grand final in Karachi last March which have brought real joy to the cricket fans in the country,” he said.